Meteora is a generic term for monasteries in oddly-shaped rock outcrops in the north central part of mainland Greece. Oddly-shaped rock outcrops are quite rugged and exude dignity as if they are blocked from this world, which are registered as a protected Unesco World Heritage Site. In addition, there are more than five monasteries of Greek Orthodox (Eastern Orthodox Church), so that it is counted as one of Christian sacred sites. 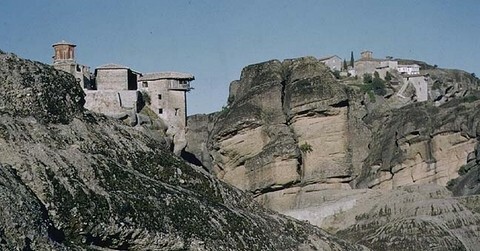 It is said that the first people to inhabit Meteora arrived in the 9th Century. It is said that people settled in a topographically complex place called oddly-shaped rock outcrops in order to communicate with God in the blocked space, and people who escaped from the war in the 14th century settled in, which gradually grew into a small community. Therefore, most monasteries in this area had been built from the 14th century to the 16th century. There were 24 monasteries in Meteora at most, but the number of monasteries has decreased due to the decrease of the number of monks and now there are only 6 monasteries. It is general to use train or bus from the town called Kalambaka to visit Meteora. And now it is registered as a World Heritage Site, so it is not only a sanctuary for monks and Christians, but also a tourist destination that accepts many tourists every year.